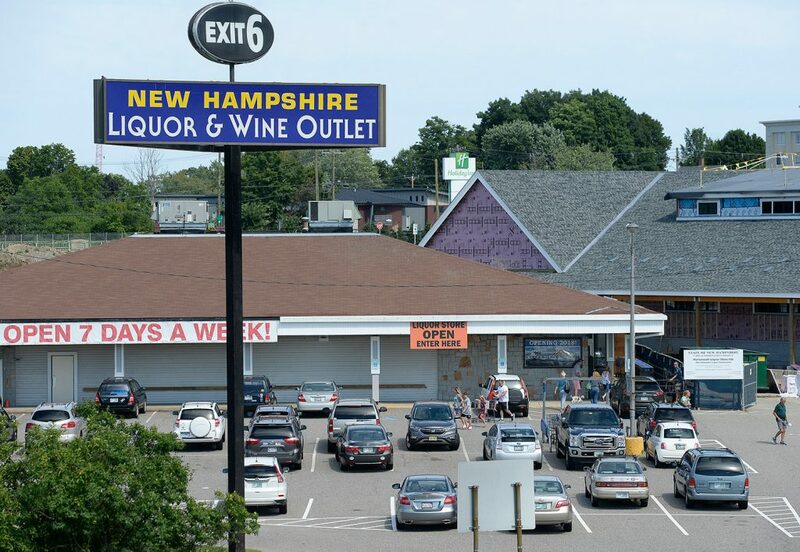 The New Hampshire liquor store at Exit 6 off Interstate 95 in Portsmouth will be among those offering discounts to out-of-state buyers. New Hampshire is trying to lure more out-of-staters to its liquor stores, using a promotion that Maine-based critics say is a cheap shot. From now until Labor Day, out-of-state residents can get up to a 13 percent discount for alcohol purchases at state-owned liquor and wine outlets across New Hampshire, a promotion derided as a “gimmick” by Maine’s liquor agency. The New Hampshire Liquor Commission is offering Mainers an 11 percent discount through one-time coupons. The sale is meant to draw attention to the state’s lack of a sales tax. 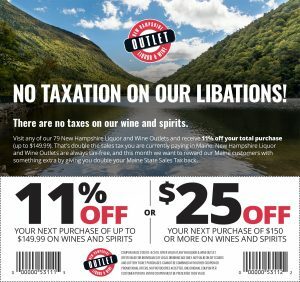 The “No Taxation on our Libations!” promotion is the first time that New Hampshire has offered a specific discount to lure out-of-state shoppers. Residents of Maine, Massachusetts and Vermont can receive a discount equal to double their home state’s sales tax. For Mainers, that means 11 percent off a purchase of up to $149.99. New Hampshire shoppers, and those from outside the three-state region, will get a flat 13 percent off. “We are always trying to create additional ways to engage our consumers to coming into our outlet locations,” New Hampshire Liquor Commission Chairman Joseph Mollica said in an interview Thursday. The pitch seemed to strike a chord with thirsty shoppers willing to submit an email request for a coupon. “In less than 24 hours we have had tens of thousands of (online) engagements from 36 states,” more than any other online promotion, Mollica said. To get an online coupon, shoppers submit their email address and state of residence through the liquor outlet website. Unsurprisingly, states with the heaviest participation so far are New Hampshire, Maine, Vermont and Massachusetts, with substantial interest from Connecticut and New York, Mollica said. Last year, Maine residents made up 7 percent of New Hampshire’s outlet liquor sales, the same proportion as previous years, commission spokesman E.J. Powers said. That works out to about $49 million in gross sales, according to the commission’s 2017 annual report. New Hampshire timed the promotion to coincide with the height of the summer tourism season. The state’s mountains, lakes and seacoast are flooded with out-of-state visitors who are likely to stop at super-sized wine and liquor outlets placed strategically along interstate highways. But Gregg Mineo, director of the Maine Bureau of Alcoholic Beverages and Lottery Operations, said New Hampshire’s promotion is a sign that Maine’s new business model for state-run spirit sales is working, and taking a bite out of New Hampshire’s liquor sales. In 2015, Maine restructured its spirits business, adding new agency liquor stores and lowering prices, partly in an attempt to better compete with New Hampshire. Maine has increased its spirits sales substantially, from $155.5 million in 2015 to $178.9 million last year. “In addition, our competitive pricing has allowed more of our customers to purchase their favorite brands at home and encouraged Maine retailers to become agency liquor stores in bordering communities,” Mineo said in a prepared statement. At least one Maine liquor store owner said New Hampshire’s promotion is unfair. “I don’t agree with it at all. You can’t stop them from doing it, but that’s dirty pool,” said Linda Sirois, who runs My Wine-y Sister, a wine, liquor and food store in York Beach. Because Maine controls the shelf price of spirits, store owners like Sirois can’t lower their prices to compete with cheaper New Hampshire alcohol. Many tourists already make a stop in New Hampshire on their way north to Maine, but a promotion like this could make it tougher on small-business owners like her, Sirois said. Mollica brushes off criticism that New Hampshire is unfairly targeting shoppers from neighboring states. It is against Maine law to bring more than one gallon of spirits, one gallon of wine and three gallons of beer across the border at one time. Violators can be fined at least $500 and have their illegally transported alcohol seized by the state. The New Hampshire Liquor Commission owns and operates 79 liquor and wine stores. About 50 percent of its shoppers come from out of state, the commission says. The stores are the sole providers of distilled spirits, but shoppers can buy beer and wine at grocery and convenience stores. Four of New Hampshire’s 15 top-selling retail stores are located along the 16-mile stretch of Interstate 95 between Massachusetts and Maine, according to the commission. Outlets in Hampton, Portsmouth and Seabrook had sales worth $94 million last year.